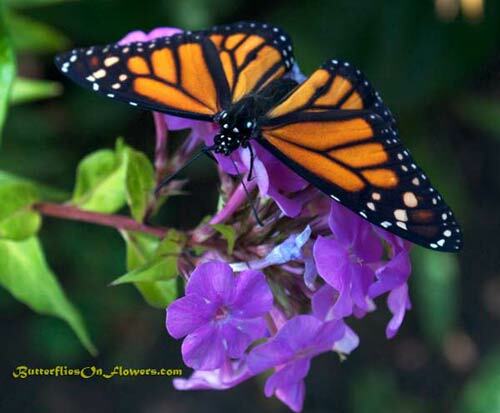 Caption: A small male Monarch Butterfly (Danaus Plexippus) perched atop Garden Phlox (Phlox paniculata). This was the last monarch I raised in 2009. I bought a 5th instar monarch caterpillar at the Minnesota State Fair in early September under the premise that he needed "no more milkweed" and would transform to a chrysalis within a day. He was so small I was certain this wasn't true, so I paid 5 bucks and rescued him from certain starvation. 4 days later after devouring tons of milkweed he finally transformed to a monarch chrysalis, and on the 15th of September a butterfly was born! Thankfully, it was a warm September or he may not have been able to join the Mexican Monarch Migration. After sunning himself on the garden phlox, this male took flight to join the rest of his friends on winter siesta. I'm happy he could make it! Butterflies Facts: Monarchs are able to fly if the temperature is above 60 degrees fahrenheit(15.56 Celsius) and 50 degrees F(10 C) if sunny. The sun makes it easier to warm their flight muscles.